Whether you have a weekend or a full week, Branson is the perfect getaway for just the two of you. You’ve worked hard, and now it’s time to play! Enjoy one of the many live shows that Branson is famous for. Try one of the traditional country music variety show like Presley’s Country Jubilee, Branson’s Famous Baldknobbers, Illusionist Rick Thomas or Grand Jubilee, or a tribute show from your favorite decade. For a Broadway-style production, see Samson at Sight & Sound Theatre. Samson breaks free from the restraints trapping him. Visit the Dewey Short Visitor Center and then take a leisurely walk down the paved path that follow the waterfront of Table Rock Lake. Spend part of an afternoon at one of Branson’s wineries or distilleries. Or pamper yourself with a spa treatment at Chateau of the Lake’s Spa Chateau or Cedar Creek Spa at Big Cedar Lodge. Take a journey through time at the Titanic Museum Attraction located on Highway 76 Country Boulevard. This museum curates one of the largest collections of authentic Titanic artifacts and Guardians of 2,208 passengers and crew stories sure to tug your heart strings. 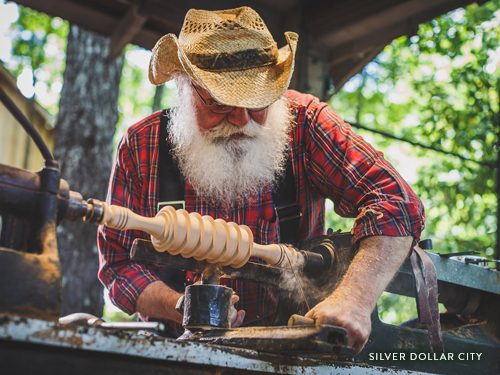 Spend a day at Silver Dollar City, where you can enjoy amazing live performances, observe skilled craftsmen and find that unique gift for everyone on your list. Check out The Festival of Wonder from April 10-28 and the Bluegrass and BBQ festival from May 2-27. A craftsman at Silver Dollar City creating a wooden piece. Stroll through Branson Landing for shopping and dining in a beautiful setting along Lake Taneycomo. Or play a round of golf at one of Branson’s esteemed courses, each designed to give you an enjoyable golfing experience that highlights the beauty of the Ozark Mountain landscape. At the end of the evening, head over to the Branson Ferris Wheel for a slow-paced ride. After you ride, grab a sweet treat at Andy’s Frozen Custard and gaze up at the Wheel for Electrify: A Light & Music Spectacular, a choreographed light show on the Wheel that runs on the hour. 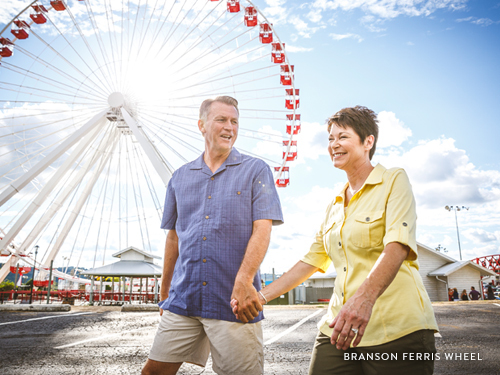 A couple walking to the Branson Ferris Wheel. Whatever you choose to do during your time in Branson, take time to relax and enjoy. You deserve it! Start planning your trip to Branson and order a Vacation Guide.